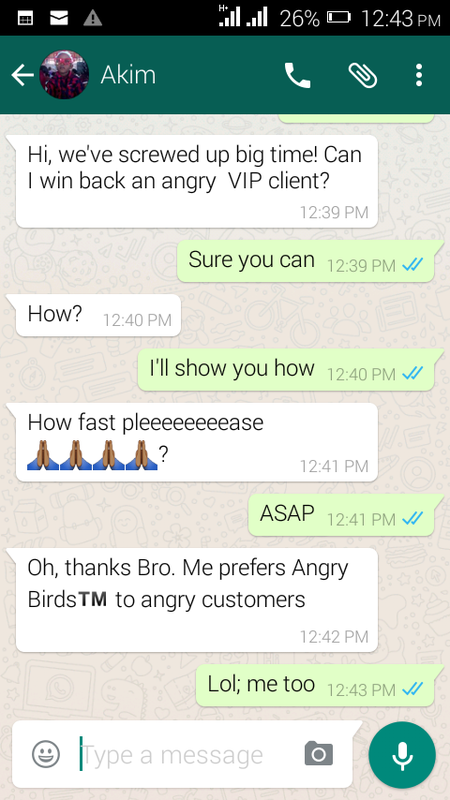 Want to win back your angry customers ASAP like Akim my friend or stand akimbo and watch disappointed customers disappear with your money in their pockets? The above scenario mirrors the experience of many business owners, particularly those in competitive niches. They understand the value of a good customer and even the occasionally good customer, they know customer retention is 5x cheaper than customer acquisition. According to a Walker Study, 86 percent of buyers will pay more for a better customer experience. The report also states that by 2020 customer experience will overtake price and product as the key brand differentiator. Customer experience CX, is the customer’s perception of how your business treats them. The bad news, perception is subjective; sometimes no matter how you try some customers perception will always get in the way. To them customer delight is the amount of stress they are able to cause your Customer Service Reps. If you own or run a dropshipping ecommerce business, this becomes even more challenging because you do not see what your suppliers deliver to your customers on your behalf. This can lead to unpleasant experiences if customers get less than what they expect. In 2016 there were over 3billion internet users worldwide, global internet access stood at 45 percent. What this means? Your target market can now access way more options straight from their phone inbox, social media feeds, bulk SMS etc. Improved internet access increases competition. Suddenly you’re competing with brands from other lands, most of which are online offering products or services similar to yours. Your competitor is now just one click away. People are now more connected than ever, Facebook has over 2 billion monthly active users. Part of what they discuss; their terrible customer experiences. Helpscout reports that there are over one million customer service related tweets daily, 80 percent of them negative. Nothing spreads word of mouth like social media. Your screw up can go viral in minutes, get thousands of shares and appear as feeds in millions of social media accounts. You don’t want that. These days the customer is no longer just John, it includes those many others over whom John has significant influence, those who can either buy or fly based on John’s recommendation. And now John is upset with Akim! When clients or customers are upset, aim to not only resolve, overcompensate in a way that they smile and reward you with repeat and incremental business. I have implemented these steps severally in my independent ecommerce consultancy business with Jumia and have recorded nearly 100% success rate. Here’s what I told Akim. Do not play John Terry. As seller hold forte for the manufacturer as much as you safely can, even if your ToS says otherwise. Why win the case and lose the briefcase? If the complaint was made online, quickly investigate, admit if at fault and address ASAP. After fixing, encourage client to drop a kind word on same medium where the complaint was laid. American Express Survey reports that Americans tell an average of 9 people about good experiences, and 16 people about poor experiences. Where possible apologize with company branded SMS, email, real mail, a personal call or note from the CEO for smaller businesses will be awesome. It’ll make John feel special and hopefully prepare him for a comeback. Given the right conditions, angry clients will vent. Listen actively, show understanding and empathy, nod occasionally, maintain eye contact if in person, lean forward toward client, express all that go-on-I’m-listening gestures, and take notes. It all shows you care and genuinely want to be of help. Provide toll free numbers or offer to call clients back if you mainly receive complaints over the phone. Reduce average hold time and average handling time if you use automated call centers, so they don’t feel you’re wasting their time. Retrieve the offending item ASAP in the case of a physical product or rollback service. The more they see the faulty product/service the angrier they are likely to get. Promise to do your best to ensure issue is quickly resolved. As much as possible offer realistic timelines to keep hopes alive and strive to beat them, under promise and over deliver. Failure to meet promised deadlines will worsen an already bad situation. Praise them for understanding. They probably worked 9 to 5, 20 days a month to save up, came a long way past a handful of competitors and did business with you before their bad experience. They reached out, complained and have agreed to wait 8 months till you fix it. That’s amazing. Update clients regularly. It keeps you on your feet and angry clients on their seats. It also reassures client that you’re doing your best to lay the matter to rest. They’ll likely let you know they appreciate your efforts. Make up for lost time or other utility derivable from the product or service. For service, you can offer a discount, free upgrade or both as compensation. Strive to deliver compensation within deadline, the earlier the better. If, however an extension is inevitable, client is likely to consent having seen your commitment to resolve issue. For physical products, demonstrate that the replacement is working perfectly before your delivery agents leave. Machines can be funny and the joke will be on you if after a long wait you still deliver a brand new faulty device. Finally, gift them a voucher or coupon, that way you’re saying come back next time and when they do you know you’ve won them back. That’s what I told Akim and that's what I tell you now. How have you handled customer disappointment in the past? Amos Onwukwe is an AWAI trained B2B/B2C Copywriter and Digital Marketer featured in eCommerce Nation, eCommerce Insights, Understanding Ecommerce, Floship, Huffington Post among others.